Rosie is a girl with a talent for inventing and engineering, which she does to her heart's content, ensconced in her attic. After one of her inventions is scoffed at by one of her relatives, Rosie becomes discouraged. One day, her great-great-aunt Rose comes for a visit and teaches Rosie invaluable lessons about perseverance and the importance of trial and error. Avery’s favorite part was “when she [Rosie] was a engineer riding in a airplane.” I included a photo of the front cover illustration--my favorite part of the book. It is a genuine representation of what a creative type's space can sometimes look like--a beautiful, organized chaos. 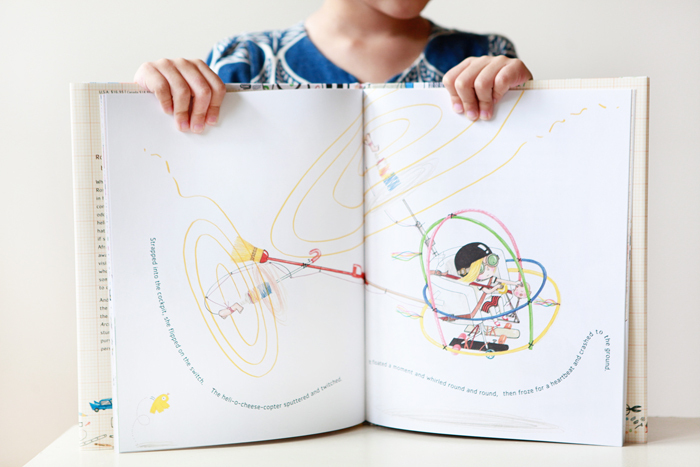 Rosie Revere, Engineer was written by Andrea Beaty and illustrated by David Roberts.